Click here to see Derek Hatch's superb eclipse images. Those listed at the top of this page decided to go to Morombe, Madagascar for a three week trip and we arrived back in the UK Friday 6 July. Apart from the potential of seeing a variety of wildlife, the major attraction for us going to the SW of the island for the eclipse was the weather prospects. Although Fred Espenak's guide for the eclipse indicated that the weather for the central and eastern regions of the island were not too good, the prospects on the south west coast were predicted to be almost as good as Angola and western Zambia. Hence our choice of Morombe. 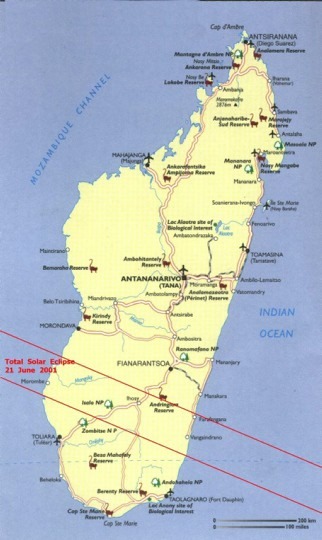 After our arrival in Madagascar, we found that the government had made a major effort to bring awareness of the eclipse and its associated dangers to the general public. Even in the smallest villages, there were eclipse posters showing how to observe the partial phases safely with eclipse glasses. However we obtained the impression that the vast majority of local people also believed that that the danger during the partial phases also applied to totality as well. Indeed as Johanna Kovitz has noted in an earlier SEML e-mail, many people stayed indoors during the eclipse - probably out of fear or due to official recommendation. We flew into Morombe on the day before the eclipse and encountered a bit of local bureaucracy. We all had to present our passports to a local police official for review. This was the only time in our trip we encountered this problem. We also noted plenty of locals out and about in the town and on the beach at our observing site. A member of our party - Hilary Bradt - even handed out free eclipse viewers to many locals to ensure that they could observe the eclipse in safety. However during the eclipse, no locals were to be seen, certainly around our beach observing site. A great pity really, as it would have been good to show local people a view of the partial phases through a telescope as at other eclipses. Later during our trip we heard stories that in some areas, a siren was sounded at first contact. Many local people (often children and older people but not teenagers) then went indoors, only to re-appear again when a siren sounded again at fourth contact. So after all the waiting, the great day arrived. The conditions we experienced at Morombe lived up to the predictions, without a cloud in the sky. The only slight problem was a light sea breeze which may have affected long exposure photography. Another friend - Paul Coleman was much further east in Isalo National Park where the conditions were less favorable due to some cloud. However after chasing some clear patches of sky he and his friends also managed to see totality. I fully agree with Sheridan that this was a beautiful eclipse. The large detached prominence and corona and coronal spikes were excellent. One friend of ours - Derek Hatch - used a Fuji digital SLR with a 500mm lens and tele-converter to photograph the eclipse. The achieved focal length was approximately 1600mm. The images obtained with this equipment are absolutely superb and there is of course the additional advantage of seeing the images immediately after they are taken and correcting exposures as required. I however was only using 'steam driven' technology (i.e. slide film) with a Teleview Pronto giving a similar image scale. It will be interesting to compare these photos (assuming they come out OK) with the digital images. We nicknamed the large detached prominence the 'Dragon' as it did look like a small dragon. This morning, I received a large blow up of Derek's digital image of this prominence and the dragon-like appearance is very noticeable indeed at this larger image scale. Although we had a shorter duration of totality than mainland Africa, and the Sun was only 13 degrees or so above the horizon at totality, there were some additional compensations. Certainly observing the eclipse at a low altitude reduced neck strain and the appearance of the eclipsed Sun over an ocean horizon was very pleasing. Further, as totality proceeded, the sky below the Sun (which included the easily visible Jupiter) remained dark but at some distance east and west were bright arcs rising out from the ocean horizon which delineated the edges of the umbra. This is one thing I will certainly remember from this eclipse. For our location, fourth contact took place at sunset. Many of us also saw the green flash. Yes we had already had drunk some wine and Champagne in celebration of totality but I don't think this was the cause of us seeing the flash!!. Derek also managed to capture this on a digital image, although very faintly. On returning to the capital (Antananarivo) we found the local press coverage (both in Malagasy and French) of the eclipse rather interesting. The newspapers only seemed to cover the appearance of the eclipse as seen from the capital (where it was partial). There didn't appear to be any coverage of totality at all. 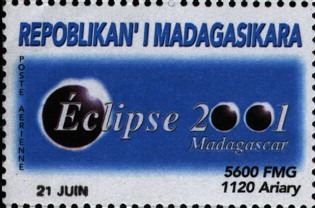 There was also frequent references to the eclipse as the President's Eclipse (presumably referring to the president of Madagascar although I'm willing to stand corrected on this, as my French isn't great. What he did to have the eclipse named after him I'm not too sure). Probably like everyone else who went to see the eclipse, we were treated to some dark skies and fine views of the southern milky way. One place that I approve of very much is the Berenty reserve in the south east of the island. Here all power is turned off at 10 pm and so with no lights, dark skies. Finally we were treated to a bonus. On Thursday evening (5 July) while waiting in a bar at Johannesburg airport for our flight home to London, we saw the partial lunar eclipse. People in the bar must have wondered what was happening as we, and some German observers returning from Zimbabwe, all rushed to the lounge windows with binoculars and cameras to observe the event. Two eclipses in 14 days is pretty good.